Baluster Dining Table. Copper top table. Custom furniture. The Baluster Dining Table was inspired by furnishings of farmhouses of the Mediterranean region. Exuding casual elegance, it makes an exceptional dining room table or foyer table for country style residential and hospitality interiors. Top options include glass, copper, brass, stone, or wood. Robust construction allows the base to support the heaviest table top with ease. It is shown with a handcrafted copper top with the optional nail-head trim. 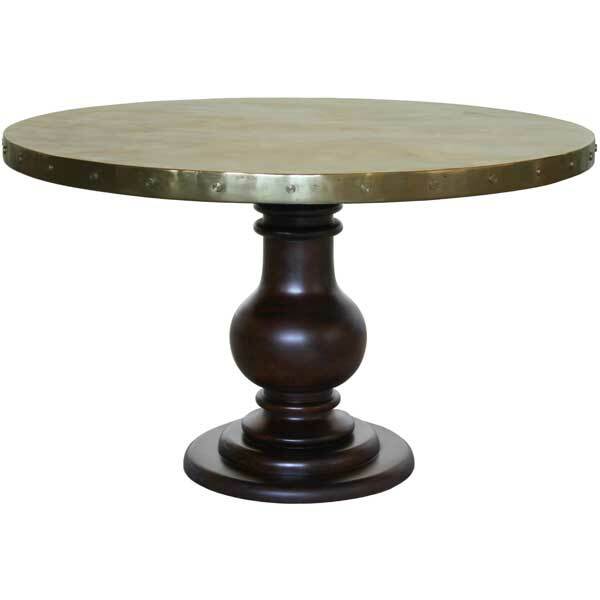 The surface of the top has been lightly distressed and antiqued. The hand-made rosewood table base is offered in a variety of finishes and accents. The Baluster Dining Table was designed by Shah Gilani, ISFD. Custom sizing is available.